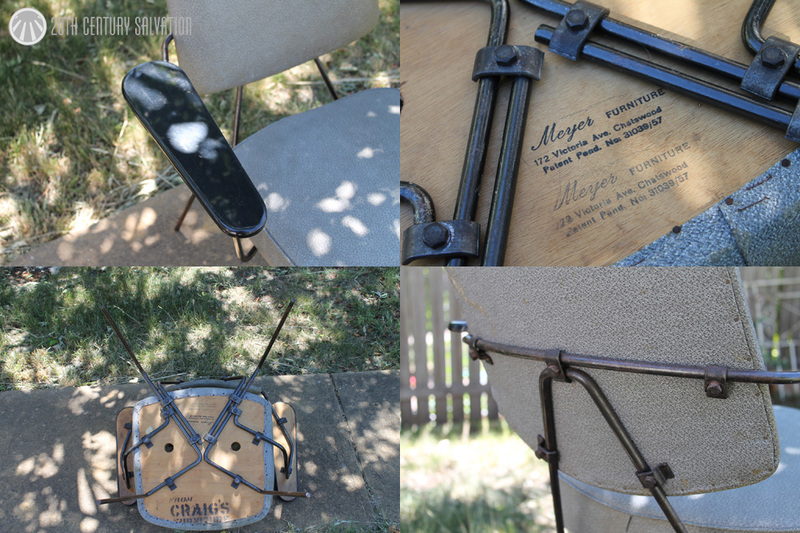 Meyer Furniture, not Myer. Got it? Good! This chair is interesting to me. Why? Well because of its construction. 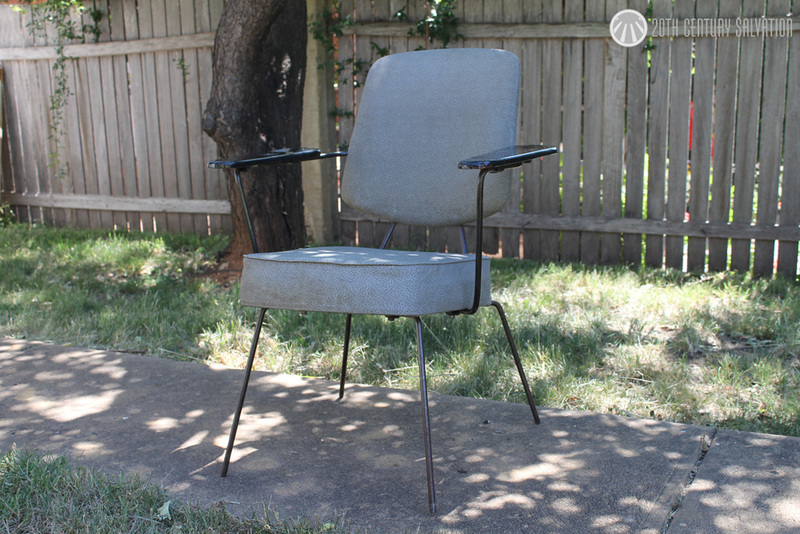 From the front it appears to be your typical steel/iron rod chair. However once you see the underside you quickly realise that the frame isn’t welded together. It is in fact bolted together using various clamps and fasteners. These hold the timber armrests (covered in plastic) / the back support and the seat all together (see photo below). It really is quite amazing, and I would imagine of been more time consuming in the final assembly stage. I am curious why a company would go away from the traditional method of say, welding the frame together to the method described above? Now I’m only speculating, but one reason I can think of is space saving for transport, just like Ikea’s flat pack furniture. You may of been able to fit say 20 of Meyer’s fully assembled chairs in the back of a delivery van, you break them down and that number could probably triple or quadruple quite easily. Another would be the ease of manufacture of each separate part off the production line. The Sydney firm of Meyer Furniture successfully tendered for the supply and delivery of steel framed cafeteria furniture for the cafeteria to be located on the fourth floor of the new administrative Building at Parkes. The furniture comprises 90 tables, and 360 chairs, and deliveries are to be completed by November 17. The accepted tender price is £2,593. 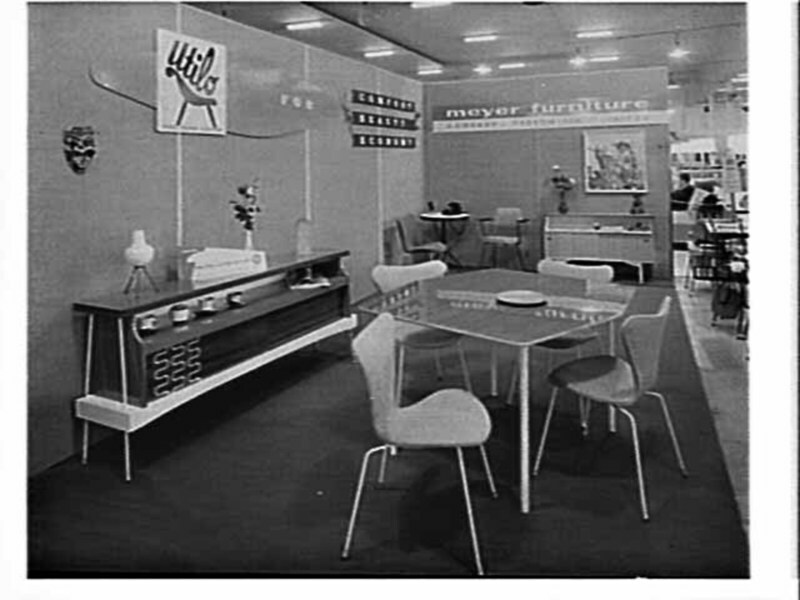 Another was a great image of their furniture stand at the 1960 Furniture Exhibition from the NSW State Library website – which I’m pretty sure shows the exact chair up against the rear wall. Unfortunately that’s all the info I can find right now, however as with most things the search never stops, it just gets put on ‘hold’ until some new information/pictures/furniture comes to light!